“Be careful in the world of men, Diana. They do not deserve you.” So states the title character’s mother in the new superhero film Wonder Woman. The quote references Diana’s decision to leave her peaceful and colorful island home of Themyscira and travel into the war-ravaged Europe during the final days of World War 2. What she finds in London is a drab land torn apart by the ravages of war and hatred. Her mother was right. The world of men didn’t deserve her but they needed her nonetheless. So do moviegoers. Directed by Patty Jenkins (Monster), Wonder Woman offers a fresh and exciting entry into the superhero genre. Unlike some of the other features in the genre, it isn’t driven by special effects and explosions. It’s driven by the story and by its leading performers. Israeli actress Gal Gadot stars as the title character. On Themyscira, she’s known simply as Diana. However, in war-ridden Europe, she becomes Wonder Woman: a tough-minded soldier who searches for Ares, the god of war. Diana believes that Ares is the evil behind World War II and that defeating him will bring the destructive war to a close. Steve Trevor (Chris Pine), a pilot who crash lands on Themyscira and befriends her, isn’t so sure. 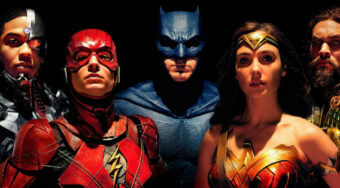 The duo team up with Diana seeking Steve’s help in bringing her to the front lines of the war, where she believes Ares is controlling the war. Wonder Woman though is more than a war movie. It’s a fish out of water story of a woman — unaccustomed to men or the ravages of war — who witnesses both as an outsider. Unlike some of the darker superhero movies, this one offers plenty of laughs as Diana becomes accustomed to her new environment. The production design of the European sequences feels authentic. The sets showcase Europe as a dark and bleak world, which makes Diana’s presence there all the more exciting. She’s a woman of vibrance and color in a world that has been weighed down by war. The drab world of the hectic Europe is beautifully contrasted by the vision of Themyscira, where the lighting shows off the openness of the community. In one of the film’s most powerful scenes, Diana — wearing a vivid warrior outfit that makes her stand out — runs across the tired and darkened battlefield. It’s a uniquely-captured sequence that shows Jenkins embracing this story wholeheartedly and being willing to take great risks in her vision. They pay off. Gadot is particularly memorable as the lead character here. Diana is both a naïve visitor in a new world and a headstrong soldier whose fighting abilities know few bounds. 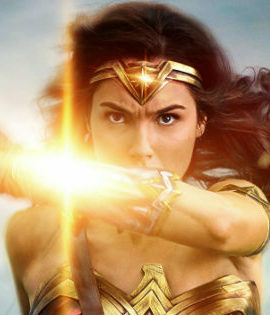 Gadot pulls off both aspects of this character, showing Diana as a fully fleshed-out hero operating in a world of chaos. For his part, Chris Pine offers a great supporting character here who understands Diana’s motivations but also believes that her intentions are naïve and short-sighted. As compared to the more recent movies in the DC superhero franchise, Wonder Woman is a wonderfully positive surprise. Here is a movie that exists in the world of superheroes but focuses on its characters and its story rather than special effects and loud action scenes. It’s provocative and exciting and one of the best superhero movies we’ve seen in years.